A senior executive of Macau casino operator SJM Holdings Ltd said Friday’s fire at the Grand Lisboa Palace construction site on Cotai would not delay work or the expected completion date for the project. 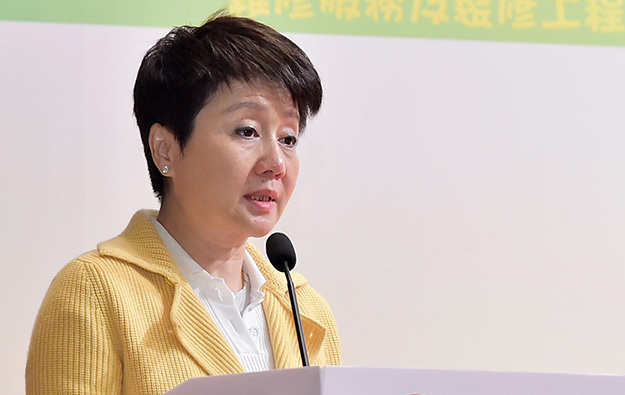 The affected area “is not that large,” said Angela Leong On Kei (pictured in a file photo), an SJM Holdings executive director, as quoted on Thursday by Portuguese-language newspaper Jornal Tribuna de Macau. SJM Holdings had stated in its 2016 results announced in late February that it expected construction of Grand Lisboa Palace to be completed “around the end of 2017, for opening in the first half of 2018”. Local media reported on Monday that the Judiciary Police were investigating the blaze as a possible case of arson. Media outlets – including public broadcaster TDM – had reported that Friday’s incident marked the third fire in two years at the construction site. GGRAsia had approached SJM Holdings on Monday for comment on that claim and whether the latest incident would delay construction, but had not received a reply prior to Ms Leong’s comments being reported. Macau’s Land, Public Works and Transport Bureau, a body with responsibility for construction site permits and worksite safety, confirmed in an email to GGRAsia that it was not involved in the investigation into the cause of the fire.